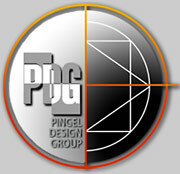 The PDG design stressed platform production. Individual steel components or "cells" are assembled and welded in specially designed jigs, including ceiling joists, floor joists and plate plus interior walls. The cells are produced in different sizes to meet all market needs. This design reduced the plant floor footprint by 20%, saving capital costs. PDG's unique building system is based on interchangeable structural "cells" with exterior panels, that look and feel like wood, stone, brick and slate. These components (cells) can be used in a variety of configurations to product homes of different architectural styles and readily customizable floor plans. Two types of panels allow for quick design changes and mass production cost effectiveness.